Armstrong 70-000 Punch and Chisel Holder. 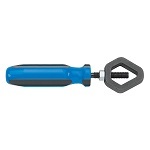 This Armstrong brand punch/chisel holder accepts up to 1-1/16" hex stock and prevents against hand injury. Length contracted is 7.5 inches while length expanded is 8.75 inches.